With a few bold pencil strokes, Doffie Arnold brought to life Seiji Ozawa, whose forceful gestures seem to be conducting not just an orchestra, but the entire world. 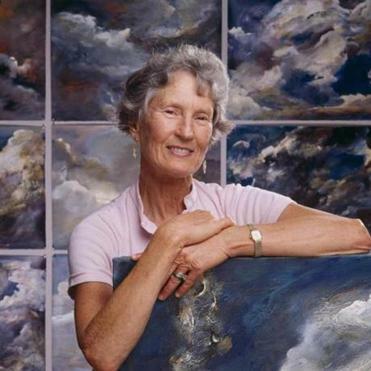 And in one of Mrs. Arnold’s more expansive acrylic paintings, the swirling skies could herald a clearing spell — or a catastrophic storm. So it was in nearly all her work, whether she used pencil, ink, or paint to create a human figure, a landscape, or an abstract. Mrs. Arnold, who in recent years turned her East Cambridge studio into a place where students in Cambridge schools could take their own first steps toward becoming artists, died May 29 of complications from dementia. She was 94 and had lived in Boston’s Beacon Hill neighborhood after spending much of her life in Concord. “She celebrates painting as a means of coming to terms with the suffering and struggle of the world,” McQuaid said, reviewing a retrospective of Mrs. Arnold’s work. Choosing subjects for her artwork that were as expansive as her approaches to a canvas or a notepad, Mrs. Arnold drew and painted people and scenes she had observed in Boston and far across the country. These were not the leaps of imagination friends and family might have expected decades ago from Dorothy Quincy Warren, a debutante who was known to all as Doffie. In March 1943, she was photographed for the Globe dancing a rumba in the Copley Plaza’s Oval Room with her fiance, David B. Arnold Jr., before he left to serve in World War II. Her father was Bentley W. Warren, an investment banker and a name partner in a Boston firm. Her mother was the former Dorothy Thorndike. The oldest of three daughters, Mrs. Arnold spent her first years in Brookline before moving with her family to Manchester-by-the-Sea. “She grew up very conflicted about the privilege she had from an early age,” said her son, David of Boston, a former longtime Globe reporter. Mrs. Arnold graduated from Beaver Country Day School and was at a social gathering when she met David B. Arnold Jr., a Harvard College student. “Mom kept prolific diaries, and her diary just gushes about this guy she met at a dance,” her son said three years ago in an interview for his father’s obituary. After marrying in 1943, Mrs. Arnold gave birth to her first child before the war ended, and had no time to pursue studies immediately after high school. It was in her East Cambridge studio, though, that Mrs. Arnold created her own visual language. While painting and in all parts of her life, Mrs. Arnold could be a whirl of motion, which was reflected in each canvas. “Her art was just bursting with energy — enormous amounts of paint and light,” said Sarah Putnam, a friend who is a freelance photographer and writer. Mrs. Arnold and her husband, who died in 2015, had been generous donors to Boston’s arts institutions. A few years ago, her family created the Doffie Project, which has raised more than $250,000 for charities by selling her paintings — 80 percent of each purchase price goes directly to a nonprofit. Her most personal philanthropy, however, took place when she opened her studio for children to use as an extracurricular arts space. She would set up tables for them and leave out paper for drawing and painting. Inviting children into her studio brought Mrs. Arnold “much joy,” said Andrew Holmes, who worked as her studio manager and assistant. In addition to her son, Mrs. Arnold leaves two daughters, Dorrie of North Granby, Conn., and Wendy of Los Angeles; her sister, Mary Gould of Bedford; three grandchildren; and two great-grandchildren. Family and friends will gather to celebrate Mrs. Arnold’s life at 11 a.m. July 27 in Trinity Church in Concord. Mrs. Arnold’s studio “was just an absolutely magical place,” said Holmes, who is Putnam’s son.